I wanted to share my story so you know that you are not alone. Our relationship with food, weight and our body is so personal to each of us that we often end up hiding our struggles and insecurities out of fear of being judged as greedy, undisciplined, vain or out of control. So, we keep our body insecurities, obsessive dieting and unhealthy food habits a secret. And, because we keep them a secret, we live with fear, guilt and shame; afraid of food, feeling guilty about what we eat and ashamed about the number on the scales and the reflection we see in the mirror. I’ve had a pretty turbulent relationship with food in the past. From the age of 14 until my early twenties, I struggled intensely with food. You name the eating issue, I’ve dealt with it: meal skipping, obsessive calorie counting, elimination diets, clean eating, anorexia, orthorexia, over-exercise, emotional eating, weight gain, weight loss… So I want to reassure you that I understand. I get it. I’ve felt the anxiety and the guilt and the shame. I’ve experienced the nutritional confusion, body-shaming thoughts and all-consuming cravings. Trust me, you are not alone in this. Up until I was 14 I had never counted a calorie in my life. I ate when I was hungry and stopped when I was full. I never had any digestive issues or intolerances. I effortlessly maintained a healthy weight, enjoyed a variety of sports and never really thought that much about what I ate other than whether or not it tasted good. Dieting was something I fell into by mistake. I don’t know the reasons why, and I’m not sure it matters all that much now, but I started restricting my food – first by cutting out chocolate and crisps, then skipping lunch at school and then purposefully limiting calories and exercising more. My weight dropped and by the time I was 15 I had been diagnosed with anorexia. I spent the next four years trapped in a cycle of hospital refeeding regimes only to come out of each hospital admission still consumed by anxiety around food. None of the things that were supposed to help (therapy, drugs, psychoanalysis, dealing with emotional issues, boosting my self-esteem…) ever worked. At 19, my weight had dropped so low I suffered organ failure. It was a big wake-up call and I managed to get my weight up to a level that, while not healthy, at least allowed me to function day-to-day. Although I was no longer at physical risk, for the next couple of years my relationship with food was far from healthy. I became trapped in a world of clean eating, calorie counting and sugar-free, gluten-free, dairy-free dieting because I thought it would make me healthier and happier. In fact, it just made me neurotic, obsessive and overly anxious about food. Dieting and the pursuit of thinness are entrenched in the Western diet culture and I got sucked in big time. I thought that my diet was a reflection of my worth and that the ‘cleaner’ I ate and the more I cut out sugar, gluten, meat and anything processed, the better I was as a person. I thought that as long as I controlled my calorie intake and placed food in strict categories of ‘good’ and ‘bad’, the less overwhelming and more manageable life would be. I attempted numerous fad diets inspired by books, blogs and social media. There was the time when I cut out all carbs because I’d read in a magazine that they make you store fat around your belly. Then there was the time when I made sure I had six meals a day because someone had told me my metabolism would slow down if I didn’t. There was also the time when I cut out all gluten and grains because I saw an article online that said they destroyed your gut. And then there was the time when I weighed and tracked every single thing I ate because I thought my appetite couldn’t be trusted. When I wasn’t worrying about what I ate for breakfast, I was worrying about what I was going to have for lunch, or if I had gone over my allotted calories for the day, or if my oats had gluten in them. But, underneath it all, my real worry was that I’d be imprisoned by these unhealthy eating habits forever. Eating clean, counting calories and creating more and more rules around food might have made me feel in control, but what I really wanted was freedom. Freedom from anxiety. Freedom from guilt. Freedom from obsession. Freedom from the thoughts that told me that carbs were the devil, eating sugar would make me fat and that I needed to keep a tight harness on my appetite at all times. Deep down, I wanted the freedom to trust my body, truly nourish myself and enjoy my life to the fullest. And that freedom does exist. Because I have found it. After going through anorexia and being told by doctors and therapists that I’d have food issues my whole life and they were ‘just something I’d have to manage’, I accepted that I would spend the rest of my life fearing food and battling my body. But, I can tell you now that nothing could be further from the truth. We’ve been led to believe that we need to live by a set of food rules because, if we don’t, we’ll lose control, eat everything in sight and gain a tonne of weight. We’ve been sucked into thinking that our bodies can’t be trusted and instead we need to rely on scientific research, dietary guidelines, food labelling and perplexing pyramids. One minute scientists are telling us to cut out fat and the next we’re being told to put coconut oil in our coffee. The dieting industry has convinced us that as long as we follow a set of food rules, cut out specific food groups and maybe add in a ‘superfood’ or two, then we’ll be healthier and happier. Well, I spent nearly a decade listening to the diet industry. And do you know what I learned? Many of the so-called ‘experts’ are wrong. I found that the more I cut out food groups, counted calories and went hungry because the latest diet said you should fast for 16 hours, or swap carbs for cauliflower, or cut out sugar because it’s ‘toxic’, the lousier my life became. Restricting my food restricted my life. There are a lot of experts out there who know a lot about food. But I realised that I am the expert of my body. Just as you are the expert of your body. This insight transformed my relationship with food in an instant. Only I knew which foods made me feel energised and which ones made me feel sluggish. Only I could tell when I was hungry and when I was full. Only I could recognise whether I was eating for physical or emotional reasons. Only I was aware of whether counting calories and cutting out food groups was helpful or harmful. And only I could decide to make peace with food, honour my appetite and nourish myself properly. So, I put a giant middle finger up to dieting, gave myself unconditional permission to eat and began learning how to trust my body. I have never looked back. Of course, after years of restricting, obsessing and relating my diet to my self-worth, it took time and practice to rebuild a healthy relationship with food. But I made the decision to let go of all the food rules and restrictions I’d developed over the years and instead simplified my diet in the direction of fresh, natural and delicious foods – the very foods my body was intuitively drawn towards. And, as I did this, I found I became more sensitive to my body’s needs and I learned that I didn’t need experts to tell me what to eat after all. I began to see that I didn’t have to spend the rest of my life counting calories, fearing fat or keeping a tight rein on my appetite. Rather than acting on thoughts that told me I needed to ‘be thinner’ or ‘eat cleaner’ by jumping on the next dieting bandwagon, I was able to dismiss these anxieties and continue to nourish myself properly. By using various spiritual and scientific strategies, I stopped letting food, and my anxieties around it, have power over me. I began eating with less fear and more freedom. Rebuilding a healthy relationship with food was pretty simple when I knew how. For years, I had known deep down that restricting food, fighting my appetite and jumping from one fad diet to the next was not bringing me the health or happiness I truly wanted, but I didn’t know there was another way. Although it felt harsh and restrictive, I didn’t see there was a better option. But now I know there is – an approach that allows me to trust my appetite and eat without rules and restrictions. I have learned to relate to food in a new, healthier, more balanced way that doesn’t involve anxiety, obsession or guilt. I have realised that I can eat in a way that feels natural to me without losing control, becoming addicted to sugar, getting bloated, breaking out in spots, damaging my gut or gaining a tonne of weight (like the media and diet industry often lead us to believe). I am no longer a slave to a diet culture that encourages self-deprivation and restriction for the sake of health. And my relationship with food is fear-free. I don’t have the ‘perfect’ diet and nor do I want one. Instead I eat whatever the heck I want, I feel strong and healthy, and I maintain my weight effortlessly through fear-free eating and regular exercise. As a side note, eating ‘whatever the heck I want’ doesn’t mean I live off takeaway pizza and binge on biscuits. It means I eat food that makes me feel happy, energised and full of life. Usually this means fresh, natural, nutrient-rich food, but sometimes I choose to eat too much chocolate, and I don’t think twice about enjoying an ice cream on the beach in the summer or ordering a slice of freshly baked cake with my coffee. Whether it’s a hearty bowl of lentil soup, a juicy fruit salad or a gooey chocolate brownie, whatever food choice I make, I embrace it without fear or guilt. cooking with spices like chilli and turmeric. eating when I’m standing up, in a rush or stressed. This is just what works for me (and I’m still learning!). These are certainly not rules and I’m not saying that these things will work for you. But I wanted to share what I’ve learned so you can get a feel for how, like me, your relationship with food can transform from one of control, restriction and paranoia, to one that is driven by self-love, nourishment and freedom. This is what Fear-Free Food is all about – letting go of rules and restrictions, exploring new foods, becoming curious about what makes your body feel good, and eating without fear or guilt so you can fall back in love with food, your body and your life. Throughout my journey I’ve learned that eating a healthy diet and being a healthy weight doesn’t have to be such a struggle. It doesn’t have to be about control and self-denial or revolve around meal plans and restrictive diets. The philosophies, tools and recipes you’ll find in this book are those I’ve learned through my own journey, my training in nutrition, degrees in psychology, work with clients, speaking with professionals, and from published research on nutrition, body image and eating psychology. This is not just about eating fear-free food, this is about living a fear-free life. 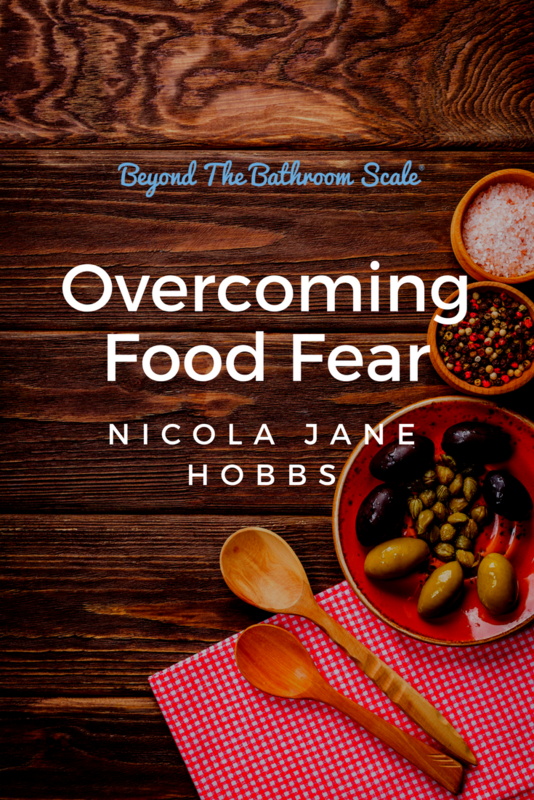 Nicola Jane Hobbs is the author of Fear-Free Food: How to Ditch Dieting and Fall Back In Love With Food* (Bloomsbury, 2018). Nicola holds a master's degree in psychology, specialising in eating and exercise psychology and is a qualified nutritionist and certified Intuitive Eating Counsellor. Nicola also teaches yoga and is the author of Thrive Through Yoga* (Bloomsbury, 2017) and Yoga Gym* (Bloomsbury, 2015). Newer PostAre you dieting because you feel out of control in your life?